In the pursuit of excellence at the level of the individual, the workforce relies on quick access to reliable information about the value of different interventions for certain conditions and for certain groups of people. Over the last 30 years mental health and addiction services have undergone, and are still undergoing, a major restructuring process. Many of the changes have been driven by the consumer movement, evidential best practice, economic considerations and the wider socio-political environment. In the midst of this constant process of structural change, the mental health and addiction workforce turns up every day to deliver the best possible service to those people that are in need of it. In the pursuit of excellence at the level of the individual, the workforce relies on quick access to reliable information about the value of different interventions for certain conditions and for certain groups of people. Whilst not all interventions may have been closely scrutinised and accepted as 'good practice', there is at least a commonly accepted process for establishing a standard. The pursuit of excellence at the level of the health system is not as clear cut and, in the face of ongoing system failures, leaders in the health sector are increasingly influenced by the organisational development movement's use of various continuous improvement approaches (e.g. Pareto principle or the 80/20 rule), quality management (e.g. Lean, Six Sigma, Lean Six Sigma) and a range of action research designs such as the Shewhart Cycle for Learning and Improvement (i.e. Plan, Do, Study, Act). Many of these approaches have begun to be adopted by New Zealand mental health and addiction providers that are looking for new ways to help structure their service improvement activities. A way of organisational life? 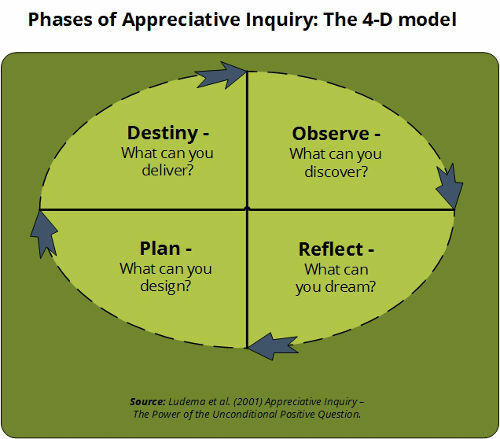 Appreciative Inquiry is a method of organisational intervention that is based on the premise that human systems grow and construct their future realities in the direction that they most persistently, actively and collectively ask questions about (Ludema, 2001). Its supporters consider that it is more than a technique, and propose it as a way of organisational life. The main difference with this model is the use of double loop thinking (i.e. thinking about thinking) and its deliberate search for alternative voices to engage in the conversation about service improvement. Lattice Consulting likes it because it is deliberately inclusive, it is focused on possibilities and it provides a supportive context for conversation and interaction amongst many different stakeholders. However, like all tools, models and theories, it may be “correct in its own world” (Deming) but it is not appropriate in all situations, particularly when a service is in crisis. 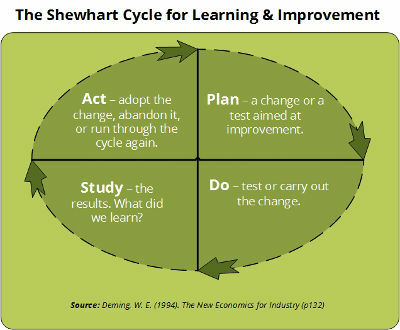 Both models described here (the Shewhart Cycle and Appreciative Inquiry) are also flawed in the sense that they imply that the process of learning and improvement is linear and straightforwardly causal when, in practice, the process is complex, iterative and emergent. Steps in the cycle get missed, repeated or end up being managed concurrently, depending on the questions that are being asked at each moment in time and on how different people are responding to the answers (Wadsworth, 2010, p74). Irrespective of whatever QI model a service does finally decide to use, Balestracci (2009) maintains that the executive leadership team needs to have a deep appreciation of the process of change and is able to create an “everyday culture of quality” within the organisation in order for the proposed change to succeed. Deming, W. E. (1994). The New Economics for Industry, Government, Education (2nd ed.). Cambridge, Massachusetts: MIT.